Israel was founded by refugees and continues to welcome Jews from around the world who wish to relocate there. During the 1990s over a million Jews from the former Soviet Union crossed the welcome mat. Jews from Ethiopia have also looked to settle in Israel, however, they have not had an easy time of things in trying to start a new life. On Tuesday, hundreds of Ethiopian Jews rallied peacefully against the discrimination and racism they claim they are experiencing. This followed a national outcry after a video emerged of an Israeli man of Ethiopian descent being beaten by police. Approximately 135,500 Ethiopian Jews live in Israel, and more than a third of them – over 50,000 – were born there. However, it would seem they are fortunate in comparison to their African neighbors who are not of the Jewish faith. 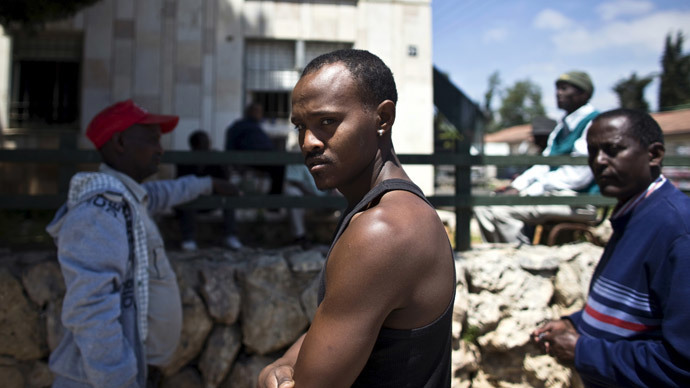 Over the last six years, Israel has a dismal rate of accepting refugees from Eritrea. Despite the fact 300,000 asylum seekers from the country in the horn of Africa have been offered refugee status around the world, Israel has accepted only four people. Aside from making it hard for potential refugees to get to Israel, the country is also giving those already there incentives to leave. A government program has offered those without legal papers the chance to return home with $3,500 in cash, the option of going to a third country, or spend an indefinite time in an Israeli prison. Over the past two years, over 9,000 Africans have taken up Israel’s offer and left. Before the crackdown began African workers could regularly be found around Tel Aviv doing menial jobs, such as washing dishes and cleaning hotel rooms which Israeli’s would not touch. “It is a form of coercion, but it is not forced deportation,” said Sigal Rozen, who works as the public policy director for an Israeli human rights group called Hotline for Refugees and Migrants. However, Rozen was adamant, “Israel should do more,” the Washington Post reported. Those who opt to stay in Israel face a tough and desolate life, as they are not allowed to work. Housed in the Holot detention center in the middle of the Negev desert, they are more than an hour from the nearest large settlement. Although they are allowed out during the day, they have to return by nightfall or risk being sent to the prison next to the detention facility. Despite the desperate circumstances the refugees face, many will never contemplate returning to their countries of origin. On the contrary, they dream of being able to travel to Europe to start a new life. “Being beheaded by ISIS [the Islamic State] or sinking on a boat is scary,” said 28-year-old Mutasim Ali, who arrived in Israel in 2009 from the Darfur region in Sudan. He has spent the past year in the detention center. “But you can’t really stay here, wasting your life, doing nothing,” he told the Washington Post. It has been reported that Israel has been in negotiations with African nations to accept more refugees, with the media speculating that Israel could offer these countries technology, money or contracts if they accept asylum seekers who are trying to settle in Israel.